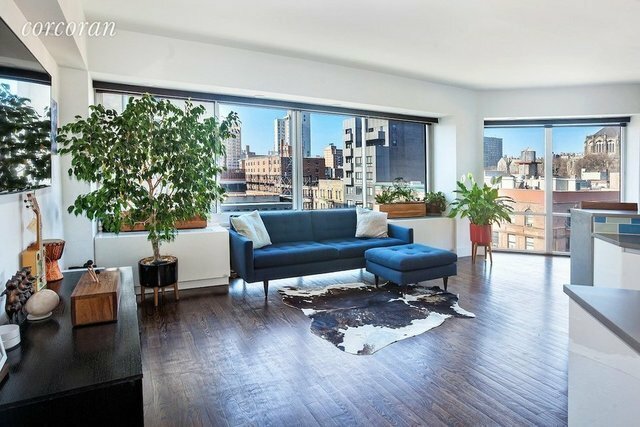 Stunning sunlight in this southwest facing 3 bed, 2 bath condo with views of Central Park and Saint John The Divine Cathedral. The Douglass is located on the Gold Coast of Harlem's restaurant row. This part time doorman building (3pm until 7am 7 days a week) has a gym and 2nd floor garden for relaxing. The home has a wonderful flow with a generous entryway that leads to the living room which has a wall of windows. The open stainless steel kitchen has a large Island. Plenty of room in the dining area for a big table making this all feel very open and airy. Recessed lighting and 9 foot large ceilings so has that lofty look. The 3 bedrooms are off to the left of the main entryway making it separate from the living room and very convenient. The master bedroom can easily fit a king-size bed, has a walk-in closet and en suite bathroom with massive shower and double sinks. The 2nd bathroom is off the hallway. The unit has a vented washer/dryer and plenty of closets throughout. Add to all of this a large additional storage bin for those items not needed every day and you have everything you need. The Douglass is located close to major subway lines, best restaurants and services.